WriteFest was established as a way to support academic writing via the #AcWriMo hashtag on Twitter. During November 2018, the LDC Development team will be running WriteFest in collaboration with the Researcher KnowHow team at the library. This is our local contribution to this global academic writing month, with the aim of bringing people together to raise awareness and celebrate academic writing. 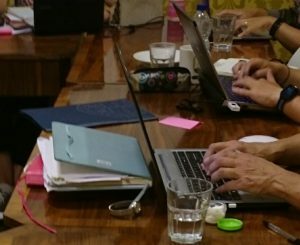 In this interactive workshop, we combine video and face-to-face facilitation to help you get to grips with creative writing methods and techniques to build writing into your daily routine. The workshop will provide a framework for understanding how writing is constructed, discuss tools you can use to approach your writing and help you to think creatively about your writing habits. Whether you are at the early stages of your PhD or in the final phase of thesis writing, this workshop will help you develop techniques to sustain your writing practice through academic writing month and beyond. The workshop is facilitated by Dr Matthew Cheeseman, Senior Lecturer in Creative Writing at the University of Derby (on video) and Dr Eli Saetnan, Academic Developer at University of Liverpool (in person).